Canvas ETC. 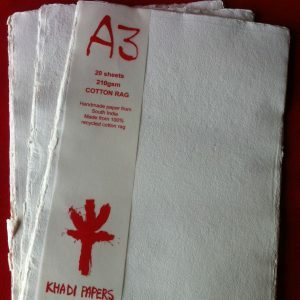 carries a fine, diverse selection of Khadi paper, or rag paper. This fine art cotton paper is not your average sheet of paper. Made from cotton rags, its unique properties are great for creative projects and applications alike. 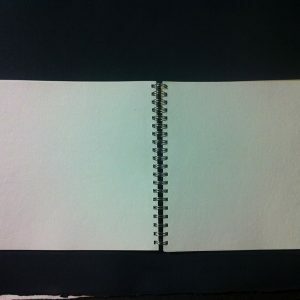 You wonÛªt find this rag based paper everywhere! 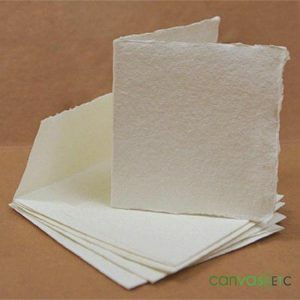 Canvas ETC.Ûªs selection of Khadi paper is unlike most. We pride ourselves in carrying only the finest styles of Khadi paper to suit all your needs. 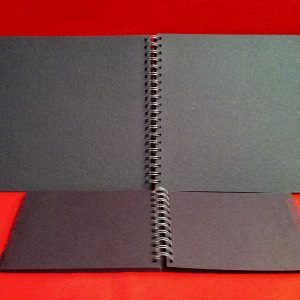 If youÛªre looking to step outside of the realm of normal artist canvas or regular paper, this uncommon counterpart is for you. 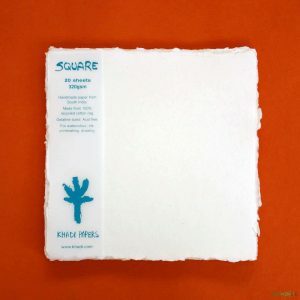 Learn more on how Khadi paper will elevate your art projects and assist in all your mindÛªs ingenious endeavors. The first traces of regular paper were found in China dating all the way back to 105 AD! First made from silk, it was eventually decided to find a more practical, abundant source– wood from trees. 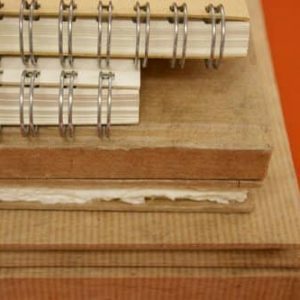 Before wood was officially used, anything from silk, linen, grass and hemp was utilized for materials in the production of paper. Around 600 years after ChinaÛªs first papermaking successes, Arabs began crafting their own sheets from linen and other materials. Ultimately however, paperÛªs production relied heavily on cotton rags and papers like Khadi were born. In India, the creation of Khadi paper allowed for the growth of jobs and industries alike. This rag paper was transformative and changed the face of how paper is made. 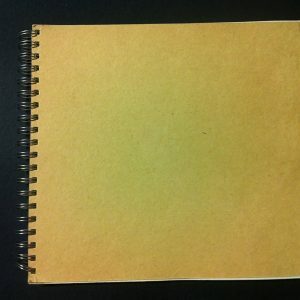 This fine cotton based paper is made possible by the rags themselves. The rags come from the Khadi fiber. Khadi, or khaddar fibers are made mostly from cotton. Initially, Khadi fibers and fabrics were manually handwoven. This process became scrutinized once textile mills started to dominate the way fabrics were made in Europe. åÊEven Gandhi himself urged that a boycott stop the entrance of foreign fabrics to preserve the spinning of handmade fibers into handmade fabrics. Conclusively, khadi did go through a semi-automatic production. Now, itÛªs spun and made into everything from ceremonial clothes to paper. Khadi papers are made from 100 cotton. As previously mentioned, this makes it ideal for projects that need to stand the test of time and fading. 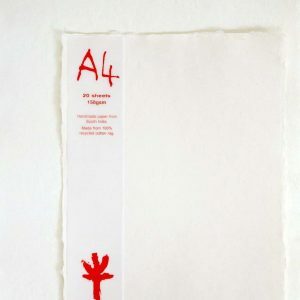 As the rag papers are made from cloth, theyÛªll allow for different materials like ink and oils to soak within the fibers better than paper made from wood. This fine rag paper first starts out in a Hollander beater. The beater removes the pulp from the cotton rags to eventually åÊbecome formed into sheets. The pulpÛªs pH levels are carefully neutralized to form acid free sheets. 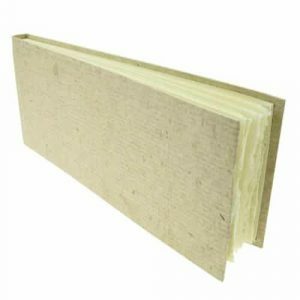 Once the pulp is thoroughly beaten, itÛªs formed onto a deckle or a special frame. 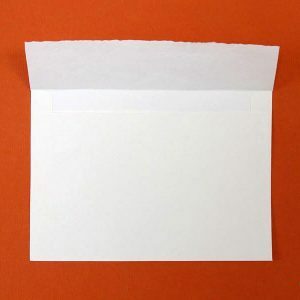 The size of the deckle outlines the size of the sheet of paper. The deckle goes into a vat of water for forming. Clean water is key in the making of Khadi rag paper. The water that lends itself to making of khadi paper is often recycled and reused so that clean, continuous water helps in the production of this paper. The recycling allows for limited water waste which makes for an efficient process. Sheets formed in the vat of water with the deckle then lay between woollen felt. To remove the excess water from the sheets, pressing occurs as the sheets stack together. The drying process begins shortly afterward. The sheets will either be left to dry if theyÛªre rough finished, or pressed between sheets of zinc to smooth them out. Afterward, theyÛªre packaged and shipped all around the world! 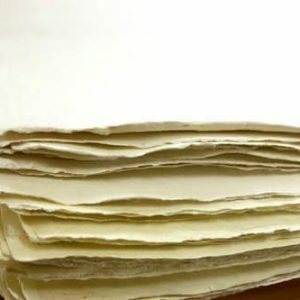 Rag based paper like Khadi paper isnÛªt limited to a certain style or size. 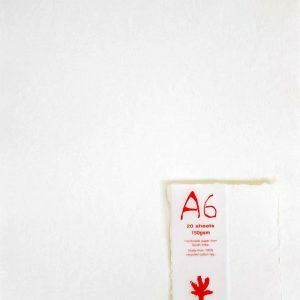 Since the medium used to produce the paper is versatile, itÛªs able to render all sorts of weights, shapes, and styles. Some common weights of Khadi paper are 100 LB, 140 LB, or 300 LB. Paper weights go hand in hand with paper thickness as well. The heavier weighted the sheet, the thicker it is. Cutting Khadi paper into different shapes depending on its use is normal. 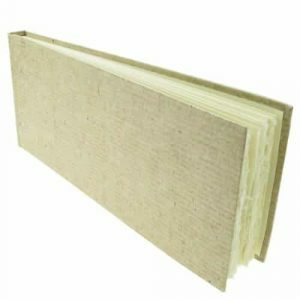 This versatile paper is available in many of the standard papers sizes like A3, A4, A5 and so on. It is also available in round shapes of various diameters. The styles of this rag based paper vary as well. It is optionally dyed into various colors and used for different projects. As mentioned, itÛªs available rough or smooth. 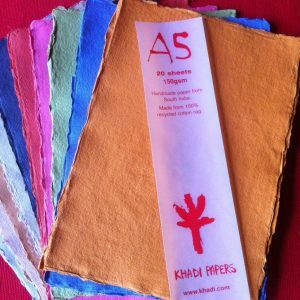 Khadi paperÛªs all around flexibility works well for anything, especially creative projects. All in all, this paper is ideal for so many different things. 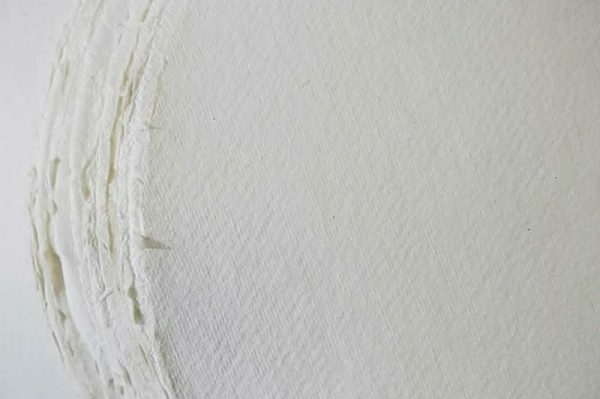 Art Canvas: KhadiÛªs long cotton fibers are perfect for stretching over wood to make a canvas! Paint sticks well to its surface and lasts for a long time. 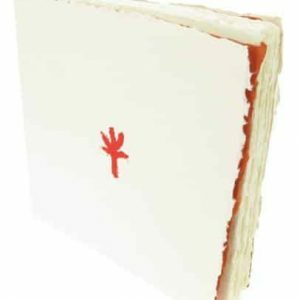 Soft Book Covers: Create beautiful, natural covers from our rag paper offering. This circular diameter is cuttable into whatever shape you require. Drawing Media: Pen or pencil, doesnÛªt matter! This khadi paper allows for all types of media on its surface. Create beautiful work you can hang afterward that will outlast regular paper. Embroidery: This paper is sturdy! Made from long cotton rag fibers, it provides a tough, long-lasting surface. Use it to embroider a fun saying or unique landscape. 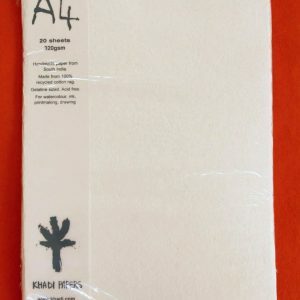 Whatever the need, khadi paperÛªs unique qualities allow for so much! 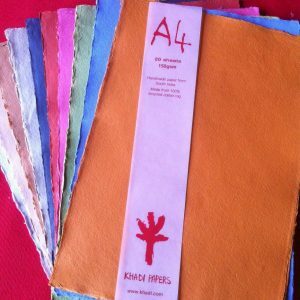 Canvas ETC is proud to carry amazingly diverse selections of Khadi paper. 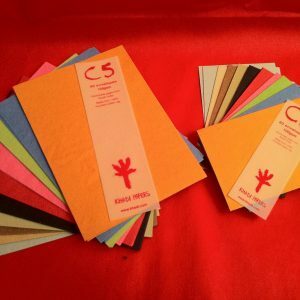 This rag based paper is perfect for so much in your creative world! If you want to learn more about how to use this paper or ordering in bulk, contact one of our experts today.